Corporal Jack Borden, of the Northwest Mounted Police, trails the man who killed his partner to New York City. The killer is an unscrupulous promoter who is selling worthless stock in a gold mine. Borden, with the help of Blanche Hall, locates the man in a Bowery dive, but he escapes and Borden tracks him back to Canada. Along the way, he discovers that Blanche and his sweetheart, Milly, are long-separated sisters and brings about a reconciliation. The storyline was showing its age, but the film still had much of interest. It is winter, and out in north west Canada a recluse lives in a remote cabin with his youngish daughter. He rides to the trading post, leaving the girl behind to do the chores, much to her disgruntlement. Meanwhile, and nearby, crooked mine owner prepares to leave the adit in charge of the foreman/sole miner while he goes to New York to raise more funds from his investors. The foreman wants to be paid first, and they fight. The owner tips the foreman into the adit and rides off. A corporal in the Mounties happens by, sees what is going on, and gives chase. Unfortunately his horse stumbles and he is hurt. The girl sees him, and helps him to her cabin where she tends him. They look into each others eyes in that deeply meaningful way they did in silents. She is scared her father will be angry, but when he returns he is sweetness and light. During the night wolves howl, and the following morning the Mountie sneaks out early and returns to the police station to report events. He goes back to the adit, and finds the foreman only injured. He explains the mine owner's scam, and limps off home. The corporal rides back to the trading post, leaves his horse in the stables, changes into civvies and takes the next train (due in twenty minutes) to New York. In the Big Apple, the crooked mine owner develops his plans, while his secretary looks on horrified. At the close of business, he starts to chase her round the office. The corporal, having arrived in New York, wearing a ten gallon Stetson, and taken a taxi across town (some quite decent shots of the city streets), goes up to the office, hears the secretary's screams, and bursts in. A really savage and brutal fight ensure with at one point the secretary apparently helping her assailant, in another the corporal and the blackguard leaning out of a window high above the streets, Harold Lloyd style. The mine owner escapes, and being 6pm the secretary goes home. Next day the corporal returns to try and find out where the mine owner lives, but nobody seems to know. However, a call takes his to the home of the secretary and her mother. It appears that several years previously her husband suspected her of infidelity and left for a remote cabin in north west Canada taking their younger daughter with him. That apart, the secretary explains that the mine owner will be meeting his accomplices at a bar in the Bowery. The corporal heads there with a NYPD detective. At the entrance to the bar, they espy the bad guys and plan a stratagem. The corporal sneaks round behind the bad guys hoping not to be noticed, despite his headgear. However, a customer warns the bar keeper of the presence of the detective, and a brawl ensues. The mine owner escapes in a taxi, closely followed by the corporal, standing on the running board of another. The shots of the chase through the (a?) city were impressively done. The first taxi just manages to cross a railway in front of a long freight train, and then arrives at a railway station just as a trans-continental train is about to leave. The corporal and the detective arrive just too late. However, our corporal takes the next train home, arriving at the trading post shortly after the mine owner has left for the adit. In the corporal's absence, the girl has been looked after by the factor and his wife, and introduced to nice clothes, rather than the shift which was her only wardrobe. She is delighted to see the corporal back, as he is delighted to see her (though he is twice her age). He changes back into uniform and heads out after the mine owner. They meet in the middle of a snowy field, and while they battle it out, their horses munch hay together. It is not clear where the hay came from in this winter wilderness. The mine owner is captured and prosecuted. The corporal then realises that the secretary and the girl are sisters, so after a discussion with his horse(! ), he sends his savings to New York, and the secretary and her mother arrive on the train to be used to take the mine owner away to prison, presumably somewhat further west. He has apparently been convicted of killing the foreman, though when last seen the foreman was very much alive. The corporal takes the new arrivals to the cabin where there is a joyful reunion between husband and wife. The two sisters also take to each other, and the elder one promises the younger to share her fancy New York modes. At this point the corporal heads back to duty: the two sisters watch him go, the younger breaking down in tears to see the love of her life ride away. From a distance he turns round, then continues away. What is not made clear is how the ladies from all mod cons New York are going to cope with the rough and ready life of a cabin in the wilds where water has to be collected from a distant stream! Some of the scenes were well done and well acted; the bar room was risible and the scene appallingly done. The corporal was OK at a distance but as wooden as the trees in close-up; the girl was very attractive and made the most of her part - it is a pity she only made a few films. Nice steam trains though. "Sands of Sacrifice" is a very old fashioned silent movie with lots of melodrama which probably played a lot better when the film first debuted. Today, most would think it all too unbelievable and silly to be taken very seriously. The story is set in Canada and involves a Mountie trying to catch an evil swindler. In the process, he also comes to meet a young lady who is being hidden in an out of the way cabin by her father. 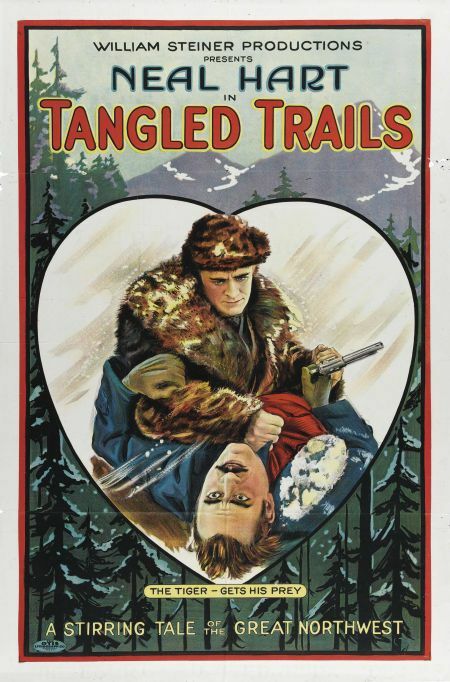 By the end of the film, the good guy manages to not only capture the Snidley Whiplash-like baddie but unravel WHY the man and young lady are in the wilderness and fix their problems as well. The story is incredibly simplistic and most folks would probably never see a film like this in the first place. But, compared to other films of the day, it's about average.